Many of the best mobile app experiences are powered by services in the cloud. Top Android developers such as Pulse and SongPop have long taken advantage of the convenience and scalability of Google's cloud platform in their businesses. Now with the Mobile Backend Starter, it's even easier to add cloud services to your apps. 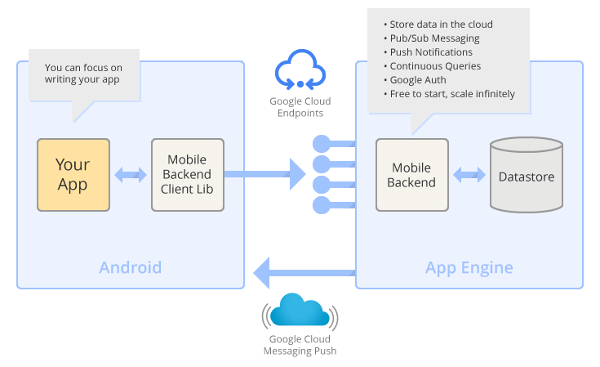 Mobile Backend Starter is a one-click deployable, complete mobile backend that allows you to reap the benefits of a cloud backend with none of the headaches. It provides a ready-to-deploy, general purpose cloud backend and a general purpose client-side framework for Android. Mobile Backend Starter gives you everything you need to rapidly set up a backend for your app, without needing to write any backend code. It includes a server that stores your data with App Engine and a client library and sample app for Android that make it easy to access that data. You can also add support for Google Cloud Messaging (GCM) and continuous queries that notify your app of events you are interested in. To keep user data secure, Mobile Backend Starter also includes built-in support for Google Authentication. Cloud data storage: Users change devices and increasingly use multiple devices. Store any amount of data per user in the cloud to be accessed from anywhere. Pub/Sub messaging: Send messages from one device, to any or all other devices. You can easily use 1:1 and 1:many messaging as well as broadcasting. This feature is useful for various applications including social apps, forums, chat, gaming, and group collaborations. Push notifications: Data updated on one device is automatically available on all devices with GCM for Android. Continuous queries: Create queries that run continuously on the server, automatically feeding updates to the client. These queries are powered by Prospective Search. Google authentication and authorization: Keep data isolated per user or shared among users. Free to get started, scales with your needs: You can start by handling hundreds of users for free, then grow to any scale. First, go to the Google Cloud Console, and create a project. Then click Deploy. Click on Settings to go to the admin control panel for your new backend. Under Authentication / Authorization, select "Open (for development use only)" and save the changes. Next, download the Android client project and open it up in your Android IDE. Locate the Consts.java file and set the PROJECT_ID to the Project ID of the project you created in the Google Cloud Console. Now just build and run the Android application and you have a cloud enabled Android application. Check out the complete docs for details on setup as well as information on how to enable authentication, send push notifications, and use standing queries. The best part is you can download the complete source code of the backend on GitHub and customize it however you want to meet your needs. To see Mobile Backend Starter in action, check out our talk at Google I/O 2013 (embedded below) called "From Nothing to Nirvana in Minutes: Cloud Backend for Your Android Application". The talk shows how to use Mobile Backend Starter to create a new backend server and integrate it with an Android app via Google Cloud Endpoints and the Google Plugin for Eclipse. We look forward to hearing your questions and learning about the amazing applications you have built. You can find us lurking on the Cloud Endpoints StackOverflow forum.